Tommy Byrne's interest in motor sports was fuelled by helping out a friend at local Irish stock-car derbies. Tommy bought an old Mini in the mid 1970s to compete in local rallies but after a crash his career seemed over. Then another friend suggested he'd go to Mondello Park and pay a visit to the Racing Driver School located on that track. He paid £15 which allowed him to do 15 laps in a Formula Ford. His reaction? "It was fantastic! After that, I couldn't think of anything else." He started to save money for a race car and in early 1977 he had bought himself a Crosslé 20F Formula Ford. He entered in a few races but didn't go anywhere. In his own words, "a complete waste of money". Tommy went back to the Mondello Park Racing Driver School to hone his skills. He achieved his goals for 1979 when he got the works seat in the PRS team, courtesy of one of the Pro Race Services principals, fellow Irishman Derek Daly, who in 1980 gave Michael Andretti a PRS ride in the USA. This time, Byrne was entered in the developed RH01/79F but the season went bad for the talented man from the Green Isle as the pressure to deliver made him ran off the track too many times. For 1980 Tommy was on the pace again in a Van Diemen RF81. His greatest career moment came in the autumn by finishing second in the Formula Ford Festival. Unable to secure money for a season in F3 he took a half-step up the ladder by moving to FF2000 for 1981. There, he duly took Bitish and European honours and stood in for a young Ayrton Senna da Silva at the famous end-of-season Formula Ford Festival, FF1600's unofficial "World Championship" at Brands - and won. Then, after choosing to do British F3 with Murray Taylor Racing for 1982, his career suddenly went boom, reaching a climax by getting into a Formula 1 car the same year! The reason for that was his stunning early-season form in Taylor's Ralt-Toyota RT3. Within months Tommy was on the brink of GP racing, which first knocked on his door in the form of an offer to join the new McLaren International team as their test driver. Amazingly, Tommy turned their offer down to take go racing with Theodore! So when Messrs Daly, Lammers and Lees failed to impress in Theodore Yip's perennial back-marker team, new blood was injected into the team, and F3 frontrunner Byrne was the man. But as we have seen so many times before when young and unexperienced drivers take the plunge into F1, Byrne's fast arrival was yet another case of having eyes bigger than your stomach. In the end, three DNQs and two starts from the final position on the grid were his meagre results. He mixed that with his commitments in F3, where he was far more successful, lifting the British title by two points from Argentinian WSR driver Enrique Mansilla, with the likes of Martin Brundle, James Weaver and Roberto Moreno further down the ranks. Ironically, his championship title's prize included a McLaren F1 test drive. And he took full use of it by setting the third fastest ground-effect time ever recorded at Silverstone! Unfortunately, his star drive at the Silverstone test did not open any doors in F1, so Byrne signed to join Eddie Jordan Racing for the European F3 championship, winning two rounds and finishing fourth in the overall ranking, albeit at a considerable distance from the season's stars, Pierluigi Martini, John Nielsen and Emanuele Pirro. At the end of the season Tommy switched to the Gary Anderson-penned works Anson-Alfa Romeo SA4B. Here he is seen at the Macau season finale. 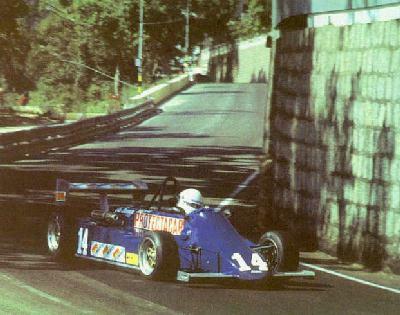 For the 1984 season Byrne stayed in F3 for another attempt at the European F3 title, again driving for the Anson team. Highlights of his final F3 year were a third at Magny-Cours and a fine fourth at the Monaco GP support race. He finished 6th in the final classification with Ivan Capelli taking the 1984 championship for Enzo Coloni. With no European prospects forthcoming, Tommy diverted his attention to North America, where he became a mainstay in the American Racing Series (later known as Indy Lights). The cars used for the series were March 85B F3000 chassis fitted with 4.5-litre Buick stock-block pushrod V6 engines instead of the 3.0-litre Cosworth V8s used on the Old Continent. In 1988 Tommy nearly forced a career breakthrough but he narrowly lost out on the ARS title. Although he won three races and led for 114 laps, a missed race at Milwaukee and a mid-season switch of teams damaged his efforts enough to see him finish runner-up with 144 points. In the end, Byrne was trailing champion Jon Beekhuis only by three points. His Irish luck once again saw him finishing second in the 1989 season. Again he could have snatched the title but he missed out once more: he was on pole for the final race at Laguna Seca and cruising in the lead when a backmarker spun in front of him, forcing him to take evasive action. He rejoined but finished fourth while his rival Mike Groff finished second and won the championship with 163 points, ten ahead of Byrne. Tommy's ARS momentum was lost after that. The 1990 ARS season was dominated by Canadian Paul Tracy, who swept the first seven races before Byrne took his only win of the season at Detroit. When the season closed, Tracy had won nine of his 14 starts, winning the title with 214 points. Byrne finished outside the top ten, his career now truly on hold. After a season in Mexican F3 he seems to have disappeared from the racing scene. It's only recently that Tommy has revived his international career, returning to race a Greenman Racing Porsche 911 GT3-R in Grand-Am, with American gentleman racers Millman and Peterson. Tommy Byrne makes his first appearance in Formula 1 driving for Theodore in practice for the 1982 German GP at Hockenheim. The Theodore racing team was the child of Indonesian multimillionaire Theodore "Teddy" Yip. A former racer, Yip formed Theodore racing to enter cars in the prestigious Macau Grand Prix, winning on six occasions. Yip would sponsor Vern Schuppan's Formula 5000 effort in 1974, and move up to Formula 1 with him in 1975. Alan Jones would benefit from Yip, who sponsored Jones' 1976 US F5000 effort. Back to Formula 1 for the 1977 season sponsoring Patrick Tambay in the second Ensign car racing under the Theodore Racing banner. For 1978, Yip had the Theodore TR1 chassis built for the team. It was designed by Ralt's Ron Tauranac and built in Britain. The car was not competitive and the F1 rookie Eddie Cheever failed to qualify in its first two appearances. 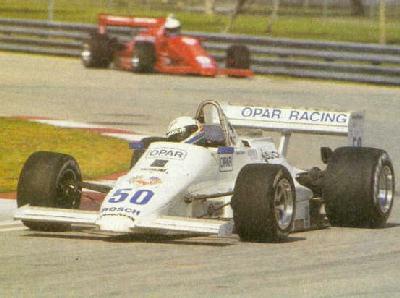 Keke Rosberg would put the car in the show at South Africa, but DNQ for the next four races. After qualifying twenty-third at Sweden and finishing a distant fifteenth, Rosberg quit the team. Yip would go out a purchase a Wolf chassis and Rosberg would return for the last four races, qualifying three times. Yip bought the Shadow team in 1980 and then he renamed it Theodore in 1981. The team produced its own chassis, this one known as the TY01 and designed by Tony Southgate. Tambay would drive for the team and score a sixth place finish and one point in the first round at Long Beach. Tambay would move to Ligier mid season and Marc Surer would replace him. Surer would not finish better than eighth in seven races started and failed to qualify on one occasion. The team produced the Theodore TY02 which appeared for the second race of the 1982 season. Derek Daly started the season in the car and qualified it for three races but moved to Williams after Reutemann retired. Jan Lammers was hired to drive the car, and he promptly failed to qualify three straight races. Geoff Lees was brought in for one race and qualified twenty-fifth in Canada but suffered an accident on the first lap. Lammers returned for three races and made the grid at Zandvoort. Next up in the driver rotation just in time for the German GP would be the young Irish driver Tommy Byrne. Byrne had made his open wheel racing debut in FF1600 only one year earlier. Already in 1982, Byrne had won seven races and the clinched the championship in the British F3 series and had won two European F3 races. The 1982 season had thus far been a tragic one for Formula 1, with the deaths of Villeneuve in Belgium and Paletti in Canada, and it was not getting better. The leader in the championship coming to Germany was Didier Pironi in the Ferrari. In the first qualifying session on Friday, Pironi set quickest time and was on provisional pole, and with it raining on Saturday he was assured to keep it. During a practice session in the rain, Pironi attempted to pass a car and could not see the slower moving Renault of Alain Prost through the mist. The Ferrari ran into the back of the Renault and caused it to flip end over end. Pironi would have to be cut from the wreckage and his badly broken legs ended his F1 career. Byrne would fail to qualify, certainly not helped by the rain which cost him the opportunity to go faster in Saturday qualifying. Byrne would qualify last for the next race in Austria and not finish after spinning. Two more DNQs followed before he got into the race in Las Vegas after qualifying twenty-seventh when a Ligier could not start following an accident. That was all F1 would see of Byrne. In 1983 he competed in the European F3 series and finished third overall. Yip would buy up the Ensign team and compete F1 in 1983 using the Ensign N183 chassis for Johnny Cecotto and Roberto Guerrero. Cecotto would post a sixth at Long Beach, the last point score for Theodore. The team would fold following the season, as Yip moved on the Indycar racing, fearing the escalating cost of F1 in the turbo era. Byrne would move to the US and race in several open wheel series, including Indy Lights.